Celebrity Cruises fulfills dreams with remarkable vacations, builds memorable relationships with our guests and employees, provides superior returns for our shareholders, and instills our core value of caring in everything we do. 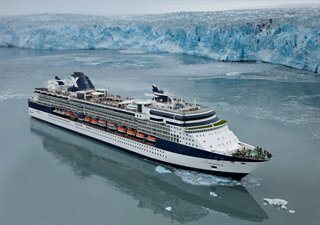 It's no surprise then that Celebrity guests and the travel press, such as Condé Nast Traveler, consistently rate Celebrity Cruises as one of the world's finest cruise lines. Experience for yourself what sets Celebrity apart. Moments join together to make a memorable cruise vacation. Aboard Celebrity, these moments include the quiet joy of discerning an Alexander Valley Cabernet from an Australian Shiraz with the help of our expert sommelier. Or the satisfaction of perfecting your culinary skills during our cooking workshop led by a top chef. Perhaps it's as simple as finding your bed turned down just the way you like it. Whatever your fancy, we're here to make it come true. Celebrity's famous personal service with a taste of luxury will make you feel like the only guest on board. Maybe it's the fact that you're greeted by name. Perhaps it's because you merely mentioned a favorite dessert and it appears without your asking. As you cool off with chilled towels upon your return from a shore excursion, you just know something is different aboard Celebrity. With one staff member for every two guests, Celebrity's personal service anticipates your every need. In your stateroom, outside by the pool, in the AquaSpa®, anywhere at all, at anytime, our onboard family goes the extra mile to ensure every aspect of your cruise is just the way you want it. Combining traditional European hospitality and warm engaging service, Celebrity's service is consistently top-rated by such experts as Condé Nast Traveler.